To invite author Bill Dedman to speak to your group, contact Pamela Hamilton by email. To invite Bill to talk with your book club meeting by Skype, reach out directly to Bill by email. C-SPAN videos are online from our appearances at two recent book festivals. Bill Dedman spoke in May 2014 at the Gaithersburg Book Festival in Maryland, and Paul Newell and Bill were interviewed at the Tucson Festival of the Book in March 2014 by journalist Bill Buckmaster. See the videos here. June 19, 2014: Bill Dedman was interviewed on "The A List with Alison Lebovitz" on Chattanooga's PBS station, WTCI. This was a chance for Bill to visit his high school, Baylor School, and to discuss his teachers, journalism, and Empty Mansions. Watch the video here. June 12, 2014: Bill Dedman was a guest on MetroFocus from Channel Thirteen in New York City. See the video here. June 14 to June 18, 2014: Christie’s in New York City sold on June 18 more than 400 items owned by Huguette Clark, after public viewings at Rockefeller Center. Read this story from NBC News for details on the showings and sales. August 1, 2014: Bill Dedman was interviewed about "Empty Mansions" and Huguette Clark by G5 Radio, which is broadcast live from KSVY in Sonoma, California, and is also carried on Indie 104 in Los Angeles and several internet stations. The hosts (Donn Dabney, Rick Miron, and Jamie Waterman) were quite well prepared to discuss "Empty Mansions." Interest in our book continues to be high in the Los Angeles area, where "Empty Mansions: The Mysterious Life of Huguette Clark and the Spending of a Great American Fortune" has been on the bestseller list at The Los Angeles Times for 31 weeks. This interview s 52 minutes. Hear the interview. Here's a photo from one of our "Empty Mansions" events in May 2014 in Montecito, California. The three speakers are shown here, along with one of our hosts from the Montecito Historical Archives, which benefitted from our gala evening at the Montecito Country Club. From left to right are Dana Newquist, one of the directors of the archives; co-authors Paul Clark Newell, Jr., and Bill Dedman, and Barbara Hoelscher Doran, who grew up at Bellosguardo as a daughter of the estate manager and shared with the overflow audience her memories of Huguette Clark and her mother, Anna E. Clark. 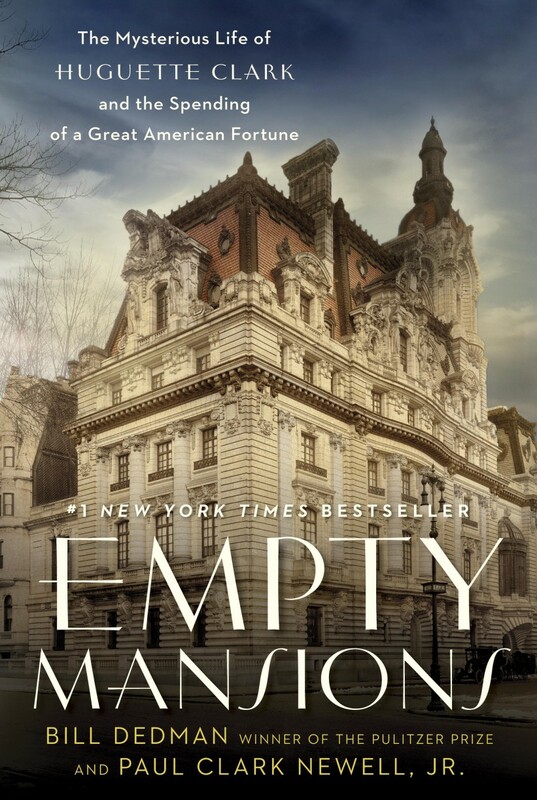 September 10, 2013: Publication day for Empty Mansions: The Mysterious Life of Huguette Clark and the Spending of a Great American Fortune. September 10, 2013: "Daily Show" interview, Bill Dedman. Watch the video here. September 11, 2013: Interview on "The Flint Report," statewide radio in Montana. September 11, 2013: Interview on "Moncrieff," Sean Moncrieff, Irish National Radio. September 12, 2013: Facebook live chat about Huguette Clark. Connect to Facebook to ask questions and participate. September 12, 2013: Interview on POTUS, Sirius XM channel 124, with Michael Smerconish. Hear the audio. September 12, 2013: Interview with John Rabe for “Off Ramp” on Southern California Public Radio. Listen here. September 13, 2013: Interview with Dr. Alvin Augustus Jones, WCBQ-AM 1340, Raleigh, N.C.
September 17, 2013: Interview, KNPR’s “State of Nevada.” Listen here. September 18, 2013: Interview, “To the Point” with host Warren Olney for KCRW and PRI. Listen here. September 19, 2013: In Connecticut, Bill Dedman speaks at Oliver Wolcott Library in Litchfield. September 20, 2013: Interview, Bloomberg Radio “Taking Stock” with Pimm Fox and Carol Massar. Listen here. September 21, 2013: Interview, America Weekend with host Paul Harris. Listen here. September 23, 2013: Interview, Leonard Lopate show on WNYC in New York. September 23, 2013: In New York City, Bill Dedman speaks at the Half King reading series, Half King bar and restaurant. September 25, 2013: Interview, WPIX Channel 11 Morning News, New York. September 27, 2013: Interview, "Lanigan and Malone," Cleveland Magic 105.7. September 28, 2013: In Massachusetts, Bill Dedman speaks at Ventfort Hall, the Gilded Age museum, in Lenox. Saturday tea and talk series. September 30, 2013: Interview, Radio New Zealand, “Afternoons with Jim Mora.” Listen to the audio. October 1, 2013: Live interview, The Wall Street Journal, with Bill Dedman on the "Lunch Break" program. Watch the video here. October 2, 2013: In Connecticut, Bill Dedman speaks at the Westport Public Library, moderated by Patrick McCord of Write Yourself Free. October 6, 2013: In Santa Barbara, California, Santa Barbara Historical Museum, reception/talk with Paul Clark Newell Jr. and Bill Dedman. October 7, 2013: In Santa Barbara, California, Santa Barbara Historical Museum, talk by Paul Clark Newell Jr., and Bill Dedman. A third event in Santa Barbara was added. October 12, 2013: In Butte, Montana, Paul Clark Newell Jr. and Bill Dedman attend two events: one at the Clark Chateau of the Butte Silver Bow Arts Foundation, and the other at the Copper King Mansion Bed & Breakfast, the former home of W. A. Clark. Sponsored by the arts foundation and the Butte-Silver Bow Public Archives. The photo exhibit continues into December at the Clark Chateau, which was the home of Charlie Clark, W. A.’s son and Huguette’s half-brother. October 15, 2013: In Connecticut, Bill Dedman speaks at the New Canaan Public Library. November-December, 2013: Butte, Montana, an exhibit of photos from Empty Mansions continued at the Clark Chateau of the Butte Silver Bow Arts Foundation, the former home of Charlie Clark, W. A.’s son and Huguette’s half-brother. The Clark Chateau, operated by the Butte Silver Bow Arts Foundation, is at 321 W. Broadway in Butte. November 10, 2013: In Connecticut, Bill Dedman speaks at the Barnes & Noble store in Westport. November 12, 2013: In Los Angeles, California, at UCLA’s William Andrews Clark Memorial Library, 2520 Cimarron Street, in the historic West Adams neighborhood. Paul Newell and Bill Dedman discuss the Clark family and its legacy. This event is held in the library of Huguette’s half-brother, W.A. Jr., in the institution he named for their father. November 16, 2013: In Las Vegas, a reception opens an exhibit of photos from Empty Mansions at the Nevada State Museum, Las Vegas. Paul Newell and Bill Dedman speak and sign books. December 19, 2013: In Connecticut, Bill Dedman speaks in Hartford at the Mark Twain House & Museum. December 21, 2013: In Connecticut, Bill Dedman signs copies of Empty Mansions near one of Huguette Clark’s mansions, at Elm Street Books. November-December, 2013: An exhibit of photos from Empty Mansions continues at the Nevada State Museum in Las Vegas. January 2014: In Montana, photos from Empty Mansions are on view Dec. 30 through Jan. 30 at the Venus Rising Espresso House, 128 W. Granite Street. March 7, 2014: In Tennessee, Bill Dedman was interviewed on WUTC (88.1 FM) in Chattanooga by Michael Edward Miller on the “Around and About Chattanooga” show. The full interview is on the WUTC website. March 11, 2014: In Tennessee, Bill Dedman is interviewed on WRCB-TV Channel 3 in Chattanooga on the "3 Plus 3" show. March 11, 2014: In Tennessee, Bill Dedman gives a public talk at the Chattanooga Public Library. Sponsored by the Chattanooga Writers’ Guild. March 15-16, 2014: In Arizona, Paul Newell and Bill Dedman speak and sign books at the Tucson Festival of Books. Videotaped for C-SPAN. March 17, 2014: In Arizona, Paul Newell and Bill Dedman speak in Clarkdale at the Clarkdale Clubhouse. The events are sponsored by the Clarkdale Historical Society & Museum. March 18, 2014: In New York, Bill Dedman speaks in Rye at the Westchester Country Club. March 22, 2014: In Connecticut, Bill Dedman speaks at the Avon Free Public Library. May 3, 2014: In California, Paul Newell speaks in Torrance at the American Association of University Women authors luncheon. May 5, 2014: In New York, Bill Dedman speaks at the Barnes & Noble, 82nd Street and Broadway in Manhattan. May 9, 2014: In California, Paul Newell and Bill Dedman speak in Montecito at Casa Dorinda. May 9, 2014: In California, Bill Dedman speaks at the Santa Barbara Rotary Club. May 9, 2014: In California, Bill Dedman meets with a book club in Redondo Beach, California. May 9, 2014: In California, Bill Dedman speaks at the Santa Barbara Historical Museum. May 9, 2014: In California, Paul Newell and Bill Dedman speak at a fundraiser for the Montecito Historical Archives, at Montecito Country Club. May 10, 2014: In California, Paul Newell and Bill Dedman tour Bellosguardo, the Huguette Clark home in Santa Barbara. May 10, 2014: In California, Paul Newell and Bill Dedman speak at the Santa Barbara Public Library. The conversation is moderated by Scott London. May 15, 2014: In Colorado, Bill Dedman speaks at the annual fundraiser of the Denver Foundation. May 17, 2014: In Maryland, Bill Dedman speaks at the Gaithersburg Book Festival. Live on C-SPAN. May 21, 2014: In New York, Bill Dedman speaks to the Meadowbrook Women's Initiative, Great Neck. June 2, 2014: In Washington, D.C., Bill Dedman is a guest on WAMU 88.5 FM (American University radio) on the "Kojo Nnamdi Show" to discuss Huguette Clark, changes at the Corcoran Gallery of Art, and related issues from our book, "Empty Mansions: The Mysterious Life of Huguette Clark and the Spending of a Great American Fortune." See the show's page at http://thekojonnamdishow.org/. June 12, 2014: In New York, Bill Dedman was a guest on MetroFocus from Channel Thirteen in New York City. See the video here. June 14 to June 18, 2014: In New York, Christie’s sold on June 18 more than 400 items owned by Huguette Clark, after public viewings at Rockefeller Center. Read this story from NBC News for details on the showings and sales. July 24, 2014: In North Carolina, Bill Dedman meets with a book club in Cary. July 28, 2014: In Georgia, Bill Dedman meets with a book club in Sandy Springs. August 7, 2014: In New Jersey, Bill Dedman speaks to a "Toast of Manhattan" event for doll collectors, meeting in Edison. August 17, 2014: In New York, Bill Dedman speaks at the Quogue Library, in the town of Quogue near the Hamptons area of Long Island, in its "conversations with the author" series. August 20, 2014: In California, Bill Dedman meets with a book club in Los Angeles. August 21, 2014: In Ohio, Bill Dedman meets with a book club in Cleveland. September 3, 2014: In North Carolina, Bill Dedman meets with a book club in Chapel Hill. September 8, 2014: In Arkansas, Bill Dedman meets with a book club in Jonesboro. September 22, 2014: In Arizona, Bill Dedman speaks and signs copies of Empty Mansions at Changing Hands bookstore in Phoenix. September 22, 2014: In Arizona, Bill Dedman speaks at Arizona State University in Tempe at the Walter Cronkite School of Journalism and Mass Communication, as a Poynter visiting faculty member and featured speaker in the "Must See Monday" series. September 24, 2014: In Texas, Bill Dedman meets with patrons of Rosenberg Library in Galveston. September 30, 2014: In California, Bill Dedman meets with a book club in Seal Beach. October 2, 2014: In Washington, D.C., Bill Dedman meets with patrons of the West End Branch of the District of Columbia Public Library. October 7, 2014: In Connecticut, Bill Dedman speaks at a luncheon sponsored by the Darien Community Association's Women's Group. October 7, 2014: In Florida, Bill Dedman meets with a book club in Sarasota. October 21, 2014: In Connecticut, Bill Dedman speaks to donors and staff at the Bruce Museum in Greenwich. October 27, 2014: In Connecticut, Bill Dedman meets with a book club in Greenwich. October 30, 2014: In California, Paul Newell speaks at the San Diego Public Library. November 5, 2014: Bill Dedman speaks at the New Canaan Country Club, Connecticut, for U.S. Trust and Withers Worldwide. November 10, 2014: In Georgia, Bill Dedman meets with a book club in Marietta. November 13, 2014: In Texas, Bill Dedman meets for a second time with patrons of Rosenberg Library in Galveston. November 13, 2014: In Texas, Bill Dedman meets with library patrons in Atascocita. November 19, 2014: In Virginia, Bill Dedman meets with a book club at Randolph College in Lynchburg. November 19, 2014: In North Carolina, Bill Dedman meets with a book club in Chapel Hill. November 25, 2014: In New York City, Bill Dedman speaks to the Dutch Treat Club and Manhattan Women's Club. December 3, 2014: In New York City, Bill Dedman speaks to trust and estates specialists. December 4, 2014: In Arizona, Bill Dedman meets with a book club in Scottsdale. January 17, 2015: In Texas, Bill Dedman speaks at the 15th annual girlfriends weekend of the 650-chapter Pulpwood Queens book clubs, meeting in Nacogdoches. See the schedule. January 21, 2015: In California, Bill Dedman speaks at a sustainers luncheon at the Virginia Robinson Gardens in Beverly Hills. A second event has been scheduled. January 22, 2015: In California, Bill Dedman speaks at the Rancho Mirage Writers Festival in Palm Springs Valley. See the list of authors here. This event is sold out and has a waiting list. February 5, 2015: In Massachusetts, Bill Dedman speaks to clients and estate planning partners of Wilmington Trust in Boston. February 10, 2015: In Washington, D.C., Bill Dedman meets with the Princeton University Club of Washington. February 16, 2015: In Illinois, Bill Dedman meets with a book club at the Galena Public Library. February 20, 2015: In Arizona, Bill Dedman meets with a book club at Osher Lifelong Learning and Yavapai College in Sedona. March 4, 2015: In Ohio, Bill Dedman meets with a book club in Columbus. March 14, 2015: In Connecticut, Bill Dedman speaks in Southport (Fairfield) at the Pequot Library. April 1, 2015: In Ohio, Bill Dedman meets with the library book club at the Perry Public Library in Perry. April 9, 2015: In Arizona, Bill Dedman meets with a book club in Sedona. April 9, 2015: In Tennessee, Bill Dedman meets with a book club outside of Memphis. April 15, 2015: In Iowa, Bill Dedman meets with a book club in Arnolds Park. April 17, 2015: In California, Bill Dedman meets with the men's book group at The Vintage Club in Indian Wells. April 19, 2015: In New York, Bill Dedman speaks at a benefit to restore the historic Moffat Library in Washingtonville. The luncheon is held at F.E.A.S.T. Catering/Round Hill House in Blooming Grove, New York. April 20, 2015: In Ohio, Bill Dedman meets with a book club at the Way Public Library in Perrysburg. April 26, 2015: In Connecticut, Bill Dedman speaks at the Stratford Library. May 1, 2015: In New Jersey, Bill Dedman speaks at the annual wealth management women’s luncheon for clients of Peapack-Gladstone Bank at the Basking Ridge Country Club. May 14, 2015: In New York, Bill Dedman speaks to the New York Junior League. May 14, 2015: In Michigan, Bill Dedman speaks to a book club in Orchard Lake. May 26, 2015: In Arkansas, Bill Dedman speaks to a book club at the Garland County Library in Hot Springs. May 28, 2015: In New York City, Bill Dedman speaks to the MIT Club of New York. June 12, 2015: In New York, Bill Dedman meets with a book club in East Quogue. June 13, 2015: In Connecticut, Bill Dedman speaks to the Kiwanis Club in Weston. Open to the public. July 16, 2015: In Maryland, Bill Dedman meets with a book group in Laurel. August 8, 2015: In New York, Bill Dedman is one of the featured authors at Authors Night, a fundraiser to benefit the East Hampton Library on Long Island. August 25, 2015: In New Jersey, Bill Dedman speaks at Rago Arts and Auction in Lambertville. September 10, 2015: In Texas, Bill Dedman meets with a book club in Arlington. September 17, 2015: In Iowa, Bill Dedman speaks in Cedar Falls at the Cedar Falls Public Library. October 6, 2015: In Connecticut, Bill Dedman speaks to the Women's Club of Weston. October 20, 2015: In New York, Bill Dedman and Pam Belluck, husband and wife, speak on Long Island at the State University of New York at Stony Brook. This is a free public talk in the "My Life As" series, sponsored by the Center for News Literacy. October 22, 2015: In New Jersey, Bill Dedman spoke to donors at the Mayo Performing Arts Center in Morristown. October 25, 2015: In California, Paul Newell and Bill Dedman speak and sign books at Chevalier's Books in Los Angeles. October 26, 2015: In California, Paul Newell and Bill Dedman speak at one of the dinners in private homes for Literary Feasts, a fundraiser for the Library Foundation of Los Angeles. The feasts benefit the Los Angeles Public Library and its 72 locations. October 27, 2015: In California, Bill Dedman speaks at two events at the Santa Barbara Historical Museum. October 27, 2015: In California, Bill Dedman speaks to the World Presidents' Organization, Santa Barbara chapter, meeting in Montecito at the Valley Club. November 18, 2015: In Minnesota, Bill Dedman speaks in St. Paul at the Minnesota Planned Giving Council annual conference. April 20, 2016: In New York City, Bill Dedman speaks about Empty Mansions and Huguette Clark at a fireside chat in support of the Museum of the City of New York's Frederick A.O. Schwarz Children's Center. May 6, 2016: In Pennsylvania, Bill Dedman speaks at the Philadelphia Club. June 28, 2016: In New Jersey, Bill Dedman meets with a book club in Green Pond. July 16, 2016: On Long Island, New York, Bill Dedman and Pam Belluck speak at the Amagansett Free Library in its series Authors After Hours. September 14, 2016: In California, Bill Dedman meets with the Malibu Library Book Club in Malibu. October 1, 2016: In New Jersey, Bill Dedman speaks at the Morristown Festival of Books. October 5, 2016: In California, Bill Dedman meets with the afternoon book club of the Santa Barbara Newcomers Club. November 12, 2016: In Pennsylvania, Bill Dedman meets with a book group at the Frick Art & Historical Center in Pittsburgh. November 27, 2016: In California, Bill Dedman meets with a book group in West Los Angeles. January 12, 2017: In Missouri, Bill Dedman meets with 50 librarians from the Mid Continent Public Library system in Independence to discuss book groups. March 6, 2017: In Pennsylvania, Bill Dedman meets with a book group in Cheshire. April 26, 2017: In South Carolina, Bill Dedman meets with a book group in Mt. Pleasant. June 14, 2017: In Connecticut, Bill Dedman meets with a book group in Farmington. September 16, 2017: In Pennsylvania, Bill Dedman meets with a book group at the Montgomery County-Norristown Public Library in Norristown. September 28, 2017: In California, Bill Dedman meets with the history book club at the Santa Barbara Public Library. October 9, 2017: In Florida, Bill Dedman meets with a book group in Lakeland. April 18, 2018: In Phoenix, Arizona, Bill Dedman meets with a book group. May 9, 2018: In New Jersey, Bill Dedman speaks at the Present Day Club in Princeton. June 27, 2018: In California, Bill Dedman conducts a continuing legal education course for the San Luis Obispo County Bar Association, Estates & Trust Section, on lessons from the estate planning of Huguette Clark. August 13, 2018: In Edmonton, Alberta, Bill Dedman meets with a book group. August 23, 2018: In Port Austin, Michigan, Bill Dedman meets with a book group. October 11, 2018: In Santa Barbara, California, Bill Dedman speaks at the Santa Barbara Historical Museum. October 12, 2018: In Santa Barbara, California, Bill Dedman speaks at the Santa Barbara Club for club members and clients of Montecito Bank & Trust. October 13, 2018: In Santa Barbara, California, the opening party for the Bellosguardo Foundation is held at Bellosguardo, the Clark home. November 1, 2018: In Miami, Florida, Bill Dedman meets with a book group. November 19, 2018: In Edmonton, Alberta, Bill Dedman meets with a book group. December 5, 2018: In Santa Barbara, California, Bill Dedman leads a tour of Bellosguardo, the Clark home, as a fundraiser for the Bellosguardo Foundation. March 6, 2019: In Missoula, Montana, Bill Dedman speaks at the Montana Museum of Art & Culture.